A client holiday travel insurance scheme is available for all passengers travelling on our holidays which is arranged by Wrightsure Services (Hampshire) Limited and underwritten by ETI  International Travel Protection (ERV), the UK branch of Europäische Reiseverscherung AG, who are authorised by the Bundesanstalt für Finanzdienstleistungsaufsicht (BAFIN  www.bafin.de) and approved by the Financial Conduct Authority (FCA  www.fca.org.uk) to undertake insurance business in the UK. Wrightsure Services (Hampshire) Ltd which is authorised and regulated by the FCA (their registration number is 311394) and which is permitted to advise on and arrange general insurance contracts. You can check these details online using the Financial Services Register (accessible fromhttps://register.fca.org.uk) or by contacting the Financial Conduct Authority Consumer Helpline on 0800 1116768. Should you wish to take out this travel insurance please include the appropriate premium when booking your holiday. We will not provide you with advice about the suitability of this product for your individual needs but will be happy to provide you with factual information. We summarise below the details of the insurance cover provided which also includes 24-hour emergency service from Mayday Assistance Limited. The following is a brief summary of the cover available. Full details of cover and exclusions will be forwarded with your confirmation of booking. In any event you may ask for a specimen copy of the policy wording before booking should you wish to examine this in advance. Up to £15,000 Death and corresponding Benefits £15,000. Death Benefit limited to £7,500 persons aged 66 and over at time of travel. Premiums shown are inclusive of Insurance Premium Tax at the appropriate rate. As cover under the Cancellation Section commences immediately the holiday booking has been accepted, no refund of premium can be allowed. (Other than 14 day refund). For further details & claims procedures, please refer to your policy. a) You are aware of any medical condition or set of circumstances that could reasonably be expected to give rise to a claim (for example the state of health of a Close Relative, Business Associate or any person on whom Your travel plans depend). ii) Is receiving, or on a waiting list for, surgery, in-patient treatment or investigations in a hospital, clinic or nursing home. ii) Is travelling against any health requirements stipulated by the carrier, their handling agents or other public transport provider. iii) Is travelling against the advice of a Medical Practitioner or for the purpose of obtaining medical treatment abroad. iv) Has been given a terminal prognosis. Please note: If you are on medication at the time of travel, your medical condition(s) must be stable and well controlled. If you are travelling outside of the UK You must notify the Change in Health helpline immediately if a change in health occurs (including any change to medication) between the date this policy is issued and your scheduled date of departure. Please note this Holiday Travel Insurance Scheme is only available to residents of the United Kingdom. If you or anyone else named on this policy has not been a resident in the UK for the past 6-months this policy cannot cover you. - Any costs of repatriation or evacuation as a result of You taking part in any excluded Hazardous Activities and Sports including dangerous expeditions or from an area which is considered by Insurers to be a War Risk or Civil Hazard area. - Loss of or damage to money and valuables whilst left unattended or in/from luggage in transit. - Loss of or damage to telecommunications and motor vehicle related equipment and accessories. - Travel against the advice of the carrier, any other public transport provider, the Foreign Office or the World Health Organisation. - Any insurance event arising from You being the driver, rider or passenger of a quad bike, all-terrain vehicle or motorcycle when the insured person is not wearing a crash helmet, whether legally required locally or not. Examples of these and other conditions and exclusions are contained within the policy wording, a specimen copy of which is available upon request. If after purchasing a policy from us should you find it does not meet your requirements you have 14 days from the date of issue or prior to travel, whichever is sooner, to cancel the policy and receive a full refund of your premium. We will only use your personal details in line with our Privacy Notice. This can be found on our website or is available in hard copy format upon request and you should read this carefully and contact us immediately if you have any queries. Your personal information includes all of the details you have given us to process your insurance policy (we will not ask for more information than is necessary). We may share your data with Third Parties for the provision and ongoing performance of your insurance policy. Your data may be transferred outside the UK. All of the personal information you supply to us will be handled strictly in accordance with the applicable Data Protection regulations and legislation. 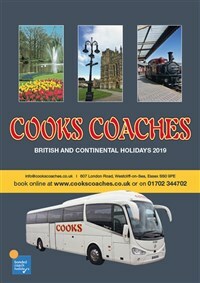 William Edward Cook t/as Cooks Coaches is an Appointed Representative of Wrightsure Services (Hampshire) Limited who are authorised and regulated by the FCA (their registration number is 311394) and which is permitted to advise on and arrange general insurance contracts. You can check these details online using the Financial Services Register (accessible from www.fca.org.uk) or be contacting the Financial Conduct Authority Consumer Helpline on 0800 111 6768.